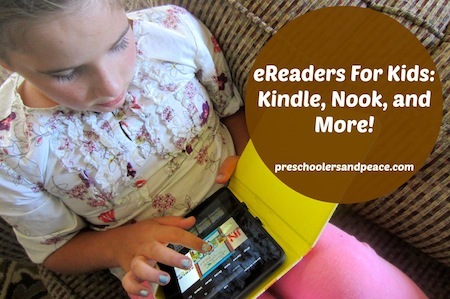 eReaders for Kids - Kindle, Nook, and More! Have you been wondering how to incorporate an eReader like a Kindle or a Nook into your homeschool? Are you thinking about giving one to your kids, but hesitant because you're not sure their usage of an eReader would justify the cost? We had a lively discussion about eReaders on the Preschoolers and Peace Facebook page several weeks ago. Some of you prefer a houseful of hardbound books and others, like mom-of-five Michele, have provided one for each of your reading children. We are a family of readers. And as with most homeschooling families, we have a lot of books. All great books. Books to be read over and over and over. We are frequent patrons of our local library as well as loyal Amazon customers who appreciate two-day shipping. Our family also travels a fair amount, in order to spend more time with my husband who travels for work. 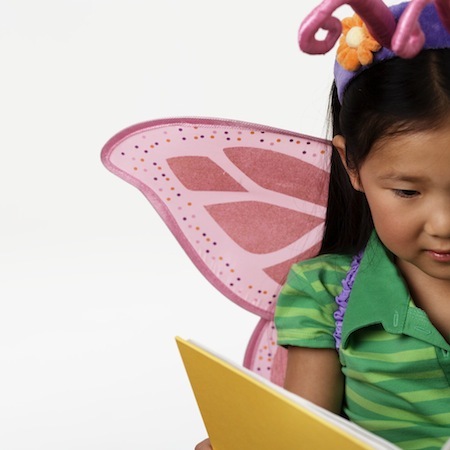 When I thought more and more about taking our homeschooling on the road, or in the air, I knew that our current method of paper books wasn't going to work long term. When each person only gets one 20kg piece of luggage, we can't fill it with books! And so we entered the world of e-readers. As Christmas neared last year and I started getting requests for gift ideas for the family, I realized that e-readers would make great gifts. Our family received two Kindles for Christmas, which we originally designated primarily for the older two children (ages 9 and 7). We set up a new Amazon account specifically for these Kindles so that the children would only have access to those books we purchase or borrow for them. Also, that Amazon account has no payment method recorded so there won't be any accidental purchases! I frequent a few websites that list free or discounted Kindle books available each day, which allows me to get a lot of books for free. My favorite is E-Reader Girl which is owned by Crystal Paine of Money Saving Mom. The ladies that run this site are careful in the books that they list so I can be confident that I won't download something that will make me blush later. Almost daily they will post a list of Christian fiction, non-fiction and children's books. At Christmas time, starting Black Friday, Amazon does some really great deals on Kindle books. I was able to buy the first six books of The Boxcar Children for only $6.99. They currently have all 12 Anne of Green Gables books for 99 cents. Many of the classics are in public domain and can be downloaded for free. Our library has over 6000 titles available digitally. Considering the amount of money that I used to pay in late fees to the library (it practically had a separate line item in our budget! ), I am happy to purchase new books for the kids occasionally just for fun. We recently went on a trip that required several hours of plane travel and waiting in airport lounges. Before we left I bought a few new books for the kids to read and didn't tell them until the morning our trip began. A fun surprise! As always be careful to put proper guidelines in place about what can and can't be downloaded. I wish I could just let my 9 year old pick her own books, but in the same way I quickly skim books she picks at the library, I require that she ask permission before downloading any books from the library. There have been times that reading the summary and the reviews of a book I have had to say no. It's frustrating for both of us, but it's a responsibility that I take seriously. Since receiving the Kindles for Christmas, my oldest daughter downloaded the Kindle app for her iPod touch and uses that exclusively. This left a Kindle just sitting on the shelf (our 6 year old previously lost Kindle privileges after not taking care of it). For nearly a year I have had the Kindle app on my iPhone and have LOVED checking out digital books from the library. But I haven't loved the small print and the amount of memory the books took on my phone. So I have appropriated that Kindle for myself and use it all the time. I still love regular books. I love the way they feel and the smell and the sound of turning pages so I won't be getting rid of all of our books or not buying any new books! But as I started to buy our curriculum for this coming year (Illuminations, by Bright Ideas Press I was thrilled to discover that I could buy over 50% of the read alouds and read alones on Kindle, making our curriculum fit even better with the lifestyle of our family. How many of you have an e-reader? Do any of your children? Do you use it just for recreational reading or for school? (As an aside, when making purchases at Amazon, just click on over to Kendra's site and choose one of her links. She'll make a few dimes on each purchase and it helps to fund her ministry here at Preschoolers and Peace).